Christopher Street at the West Side Highway, the mid-1970s. I stumbled across this photo that appears to be from the 1970s. The World Trade Center appears to be completed, which puts us after roughly 4 April 1973. The West Side Elevated Highway is still intact, and that was torn down between the spring and fall of 1981. So, we are somewhere between 1973 and 1981, and the cars look as though they belong in the mid-1970s to me. 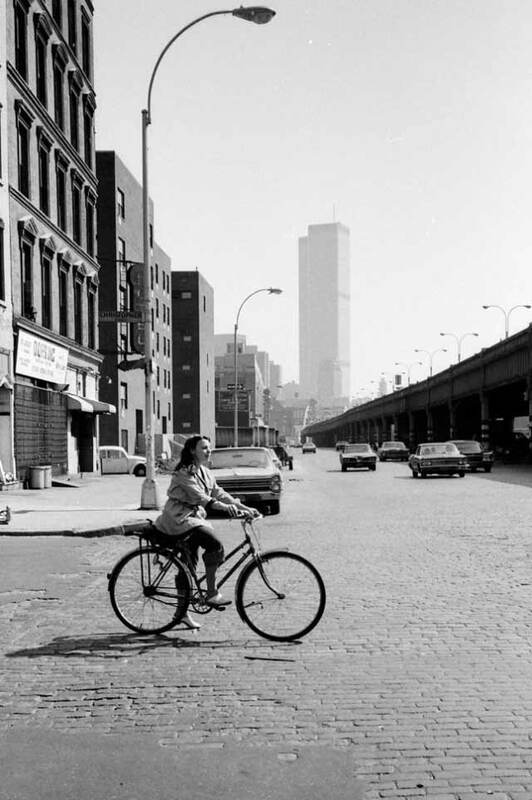 I decided to do a comparison of Christopher Street at the West Side Highway between the mid-1970s and 2018. 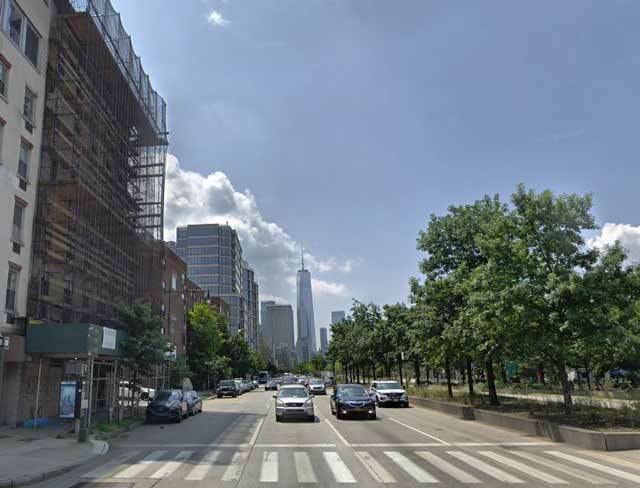 The first thing to do is to make sure that we're located in the right place, the southern corner of Christopher Street as it exits toward the West Side Elevated Highway. Notice the building to the left of the young lady riding her bicycle. It has distinctive window cornices. 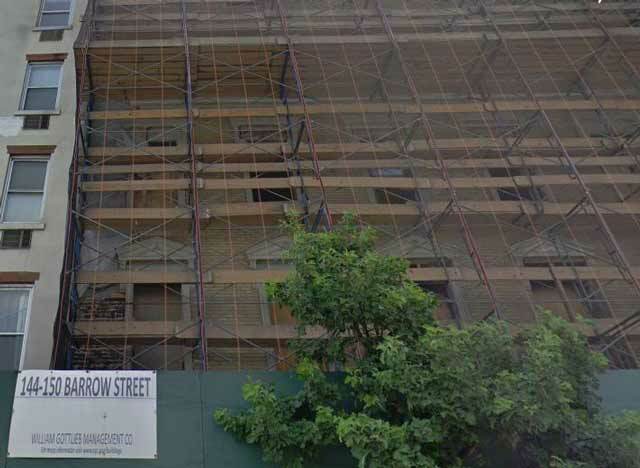 Well, a close-up of the facade of that building, directly below, reveals that building to be 144-150 Barrow Street, which was being renovated when the Google vehicle rolled by. So, we have a positive match. 144-150 Barrow Street recently (Google Street View). Just to orient anyone unfamiliar with the area, here is a photo of the same location looking due west - the direction that the lady on the bicycle is riding. In the 1970s, though, she would not have had this view. The view to the river would have been completely blocked by the elevated highway except between the girders. You can see Hoboken across the river in the below picture quite clearly. It appears from the current site of the 1970s photo, below, that the other buildings are the same, too, though it's tough to verify that the building to the left of the one with the window cornices is the same - it probably is, but with a new facade. New York City preservation laws protect these run-down old buildings, else they would all be replaced by high-rises. The most distinctive changes, of course, are the replacement of the World Trade Center with the One World Trade Center Freedom Tower and the removal of the elevated highway. I bet nobody in the 1970s would have thought that the brand-new World Trade Center would be long gone by 2018, but things happen. Of course, everyone gets sentimental about the horrific tragedy of 9/11 and all the deaths that occurred then. Purely from an aesthetics point of view, the Freedom Tower is an improvement over the bulky World Trade Center in my very humble opinion. I'm sure many prefer the look of the old WTC, and, obviously, the tragic cost of having to replace the original was a price nobody would ever want to pay willingly. But, you make the best of a bad situation and move on, that's the story of the Big Apple and this particular street corner. This area has been the subject of fierce controversy over the years. The initial thought was to build Westway. The highway would have been placed well to the right of where it is now, with the entire waterfront filled in with concrete and new buildings. Given the huge preservation effort in the city which protects how things are, however, Westway never had a chance. So, what resulted was the rather inefficient highway shown below which effectively cuts the waterfront off from civilization. There really was no perfect solution, but at least there isn't a hulking steel mountain in place which blocks off access and the views of the Hudson and New Jersey. The area is much nicer now. Notice the worn streets of the 1970s, which cars would rumble across and which tested their shocks. Those streets were a lot more common back in the day and gave the area a distinctive character. Now, everything is smoothly paved just like everywhere else in the city. One other major change is the presence of trees in the photo below. Back in the 1970s, it was rare to find trees outside of the various parks, and the trees that were there were usually sad specimens. The trees give the area color and vitality that was completely absent in the stark concrete jungle of the 1970s. However, the basic idea is completely unchanged: using the city's edges to move traffic. That will probably never change, it's just too convenient even if it decapitates the shoreline and turns it into an afterthought to life in the city. Thanks for stopping by for this latest in my series of "the more things change, the more they stay the same." I hope you find it as interesting as I do in preparing it! Christopher Street at the West Side Highway, the mid-1970s (Google Street View).